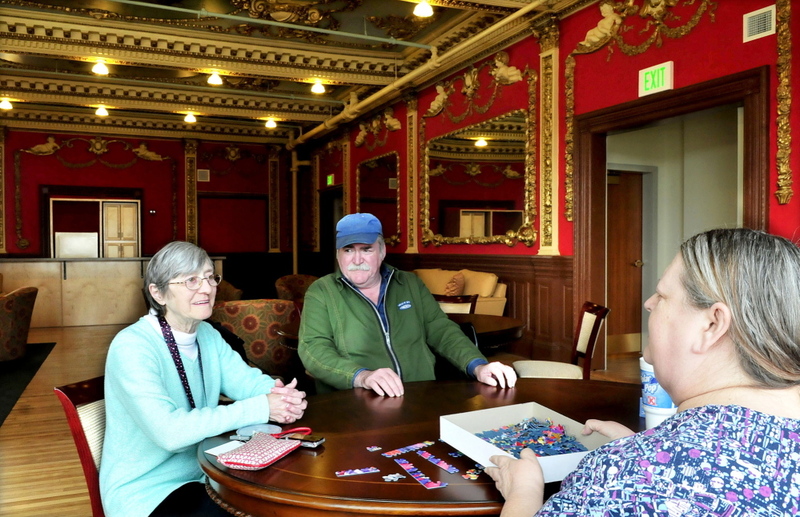 The hotel’s new senior residents have created an emerging culture of storytelling which honors the historic roots of the downtown building. It was 1978. Mary Dixon, 32 at the time, worked in the kitchen as she sang along with “The Old Rugged Cross,” a church hymnal spinning on her vinyl record player. She didn’t hear her husband come in. His name was Clifford Dixon, but everyone called him Cookie. “He were down in the garden and he happened to come up the cellar, up the back way,” said Dixon, who is 67 today and one of the new residents of the revitalized Gerald Hotel in Fairfield. She wasn’t one for singing in front of crowds. She told him she would think about it. Dixon shared the story from her rehabbed apartment in the Gerald, which until recently was the dilapidated shell of a once-grandiose hotel. The hotel was built by Amos F. Gerald in 1900 for affluent tourists and operated until 1937. Two years ago, a $6.5 million renovation project gained traction, allowing it to be converted into the Gerald Senior Residence, a 28-unit residence for income-eligible elders, owned and managed by the Kennebec Valley Community Action Program. The project was funded in part by historic preservation tax credits, leveraged with the promise that many of the building’s unique architectural features, such as a set of stained glass windows in a stairwell, will be preserved. Suzanne Walsh, the program’s chief operating officer, said 20 of the 28 units have been filled since the hotel re-opened its doors in November. It’s been a major project for KVCAP. The group has dabbled in housing before, with three- or four-unit transitional housing buildings in the area in the past, but it has never tackled anything this ambitious. Early on, Walsh said, there were concerns about moving forward with such an enormous project. But after construction began in earnest, all the pieces seemed to fall into place. “Once we got going, it seemed more manageable,” Walsh said. Now, with only a couple of nagging loose ends to tie up with construction and occupancy, Walsh said the organization will transition to a new phase of ownership, management and maintenance. Before they arrived, no one knew what kind of culture might emerge among the hotel’s new residents, the majority of them single women who have transitioned into the hotel from housing that no longer matched their needs. Now, as the hotel’s early tenants have begun to settle in and meet each other, the residents have shown they won’t keep to themselves, but rather use the building’s communal rooms to mingle, socialize and swap stories. By remembering and sharing stories from their own lives, the women are adding a whole new dimension to the term historic preservation. Not long after Dixon and Cookie were married in 1970, she decided to pickle some beets from the garden. “I called my girlfriend Helen and asked her recipe for pickled beets,” Dixon said. Dixon carefully followed the instructions, but when it came time to eat the beets, there was a problem. “They were so hard!” Dixon’s friend, Helen Fish, said, laughing so heartily that she bent over, holding onto the doorway of Dixon’s apartment for support. Fish helped Dixon move in on Feb. 17, and has been a frequent visitor ever since, often chiming in with a story of her own. It was 1958. Fish’s husband, Allan Fish, 22 at the time, was on the top floor of a mill in Benton where he worked. A coworker offered to give Fish a ride to the ground level in the elevator, so he hopped on, lunchbox in hand. Without warning, the elevator came off its suspension system and went crashing down 25 feet, breaking every bone in Allan’s feet. Allan Fish not only regained his ability to walk but 55 years later, he’s working in the woods in the lumber industry. Walsh said she’s happy to see the Gerald’s new tenants coming together to share their stories. C&C Realty Management, the company that manages the property, has provided the residents with a services coordinator, who is on hand one day each week to help facilitate group activities. Walsh said they hope to offer educational workshops, too, on practical matters such as tips to help manage health and finances. Soon, Walsh said, she hopes to announce the name of a retailer who will occupy commercial space on the hotel’s first floor. She said discussions with an existing local retailer are nearing completion. There are already signs of life and community in the building. A flier promoting a Bible study group is posted above the group mailboxes. A two-foot-tall rabbit in the hallway outside one unit adds a personal touch to a space that, with its historical features and tin ceilings, already has plenty of character. Nowhere is the building’s rich past more evident than in the community room, which is dominated by historical features, including the original reddish-orange color on the walls, original artwork painted on the ceiling and lush woodwork with intricate details. Now, residents can gather in the room and talk about old times while working on jigsaw puzzles or watching the traffic on Fairfield’s Main Street. Dixon offered a final story. Nearly 30 years after Cookie stood at the top of the cellar stairs, listening to his wife sing a hymn, he died. It was 2006. Dixon knew it was time to fulfill her decades-old promise but she was nervous. She qued up the song on a karaoke machine she and Cookie had received as a Christmas present from their son and his wife, Doug and Rebecca Dixon. When the music came, she gathered her courage and sang to her husband. Once it was over, Dixon said she was glad she had followed through. “If I hadn’t done it, I would have always regretted it,” she said. Dixon still owns the beloved karaoke machine she once used to sing at her husband’s funeral. She is donating the karaoke machine to her fellow residents at the Gerald, a new community that is coming together in the skeleton of a historic building. She’s not sure what they might get up to with the machine, but she’s looking forward to it.